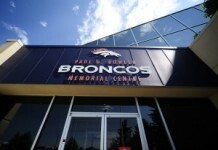 This week, the Denver Broncos finished up the mandatory minicamp phase of the offseason. Minicamp was not full-contact, but it was an opportunity for players to continue learning new schemes and developing some cohesion. That progress will be important as the season begins. It is hard to put too much stock in this non-contact work, yet there is no question that improving their offensive success in the red zone is going to be a major focus of this team. We have already seen head coach Vance Joseph paying particular attention to his teams’ success when the football gets inside the 20-yard line. He spoke to the early success of his offense on Wednesday. “The offense had a great day. They scored four touchdowns in the red zone. That’s our goal. Defensively, it’s tough because it’s not live bullets, but the routes, concepts and the throws were pretty good by the offense. That was fun to see,” Joseph said. If the Broncos are going to get back to the postseason, they must have better execution in the red zone. Back in 2013, Peyton Manning and the offense were rewriting the NFL record books with their offensive proficiency, scoring nearly 38 points per game. When they got inside the opponent’s 20-yard line, they scored points over 72 percent of the time. Manning was deadly that season. The offensive line was solid, and running back Knowshon Moreno scored 13 touchdowns. Those numbers dropped a little in 2014, but Denver still converted 63 percent of their red zone visits. They managed to score 30 points per game, and C.J. Anderson ran for eight touchdowns that year. In 2015, the Broncos had a new system under Gary Kubiak. Gone was head coach John Fox, as well as offensive coordinator Adam Gase. Also gone was the high-powered offense. The new offense under Rick Dennison struggled to find much consistency, and the Broncos scored only 22 points per game. When they got into the red zone, the dropoff was even more severe. The Broncos offense scored touchdowns on just 46 percent of their possessions inside the opposing 20 yard line. The offensive line was beginning to show flaws, and the running game was no longer much of a threat. Running back Ronnie Hillman scored seven touchdowns, but most of those were of the long-range variety. The pressure was on Manning (or backup Brock Osweiler) to find open receivers in very small spaces. In 2016, Manning was gone, the offensive line was completely overhauled. The Broncos struggled to even move the first down chains, let along score points. The Denver offense scored a measly 20.8 points per game, and they ranked ranked 28th out of 32 teams in red zone efficiency. Devontae Booker and C.J. Anderson were tied with just four rushing touchdowns each. It isn’t that a stout rushing game automatically guarantees a hearty red-zone attack, but it certainly helps. This path seems as though it would be particularly important to an offense like these 2017 Denver Broncos. 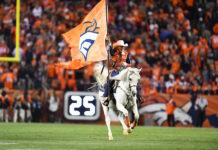 No matter who wins the starting quarterback position, the Broncos signal-caller will be relatively inexperienced. Asking these Trevor Siemian or Paxton Lynch to make the kind of throws that Peyton Manning did is unfair to each of them. Yes, they will to need to step up at some point, and make some tough throws, but the running game will need to carry the bulk of the load. 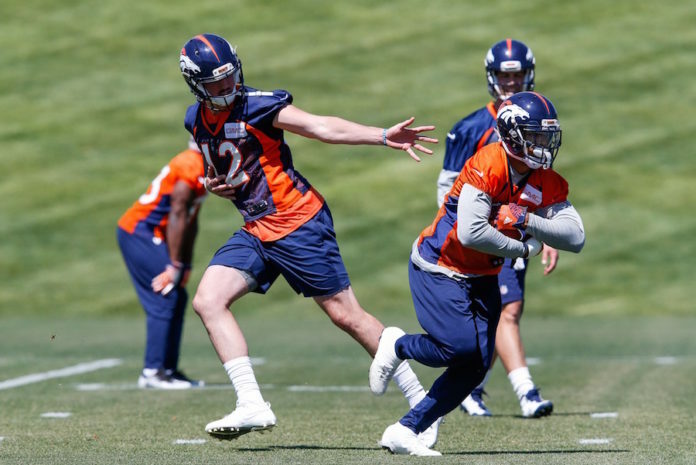 The Broncos are working hard this offseason to get this offensive front to show some improvement over the disappointing showing from a year ago. Joseph knows that is going to be the key to the red zone offense. The Broncos red zone offense has progressively declined over the past three seasons. The new coaching staff spent this week of minicamp setting the groundwork to get it back on track this year. 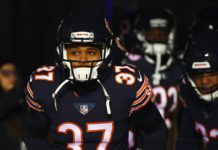 A return to even being at least average in that important area of the field, would be a significant positive step for an offensive unit that desperately needs it.